The federal budget will supply 300 billion rubles ($9.6 billion) of funding for the 2018 FIFA World Cup, excluding airports and roads, Finance Minister Alexei Kudrin said Friday. Experts say some of that funding will help accelerate regional development. Prime Minister Vladimir Putin has made it clear that he expects big business to contribute to what some say will be a $20 billion to $50 billion overall tab, with Roman Abramovich and Gazprom as two sources likely to be tapped. Russia’s victory in securing the right to host the 2018 football World Cup will mean billions of dollars of investment in stadiums, roads, hotels and other infrastructure. Prime Minister Vladimir Putin said the bill for preparations would be about $10 billion, and Finance Minister Alexei Kudrin said the main costs would start to be felt after 2013. VTB bank said the costs were more likely to be about $20 billion, while Vedomosti put the price tag at $50 billion, a figure Kremlin economic adviser Arkady Dvorkovich said was exaggerated. Major companies such as Gazprom will be expected to foot some of the bill, Putin said. Compared with nominal gross domestic product of $1.2 trillion, which is forecast to double over the next decade in dollar terms, the investment figures are modest, as is the projected effect on growth, although some sectors could get a boost. Thirteen stadiums will have to be built, while another three — Luzhniki, Dynamo and Yekaterinburg — will need to be renovated. The cost of stadium construction is projected at $3.82 billion in Russia’s bid. Moscow’s Luzhniki stadium will host the final. The government has proposed 13 host cities: Kaliningrad, Kazan, Krasnodar, Moscow, Nizhny Novgorod, Rostov-on-Don, St. Petersburg, Samara, Saransk, Sochi, Volgograd, Yaroslavl and Yekaterinburg. Events in other cities will allow fans to watch the games. The most costly investments are likely to be in transportation infrastructure. Airports will require significant upgrades, including the doubling of the capacity of Moscow’s Sheremetyevo, Domodedovo and Vnukovo airports by 2015. FIFA said Russia had pledged about $11 billion to develop its tourism infrastructure, with funding coming from private and public sources. Russia needs to build or renovate 19,000 hotel rooms, FIFA said. Internet and telephone communications will have to be improved. Running costs for staging the 2017 Confederations Cup and 2018 World Cup in Russia will cost $641.3 million, the bid has estimated. The government clearly understood the scale of the project and will now have to follow through on the financial and organizational commitments made as part of the winning bid. The Russian proposal included a pledge to build 13 new stadiums in cities across the country, renovate three existing ones, and pump $11 billion of public and private funds into tourism infrastructure, including hotels, railways and airports, to host several hundred thousand expected visitors. Putin also said during a press conference Thursday night in Zurich, where he arrived to thank FIFA for its decision, that he wants to see Russia as the winning team in 2018. Sports minister Vitaly Mutko echoed that sentiment during a joint visit on Friday with the prime minister to the South Sport athletic camp, where they shook hands and chatted with teenage football players. “The goal is to make a team of 11 players that will win in 2018,” Mutko said to the boys, who will be in their early twenties when Russia's turn to host the World Cup comes. 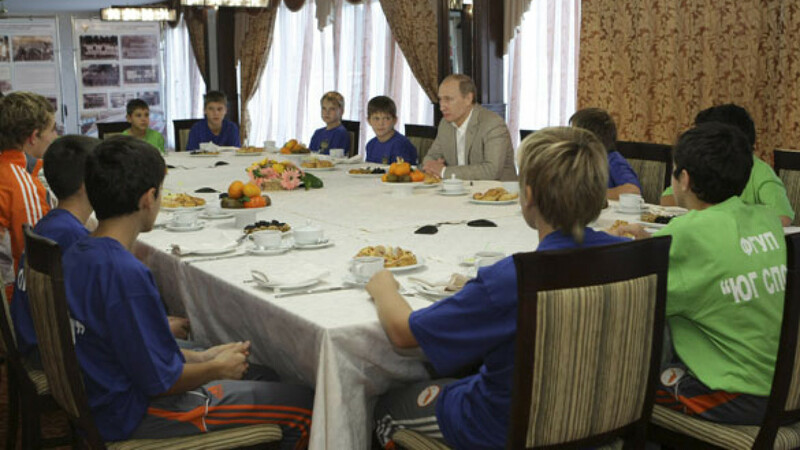 The minister said Russia has 1,400 football schools with 480,000 kids participating. The prime minister made it clear that he expects Roman Abramovich, whose personal net worth is estimated at $11.2 billion by Forbes, to help his motherland prepare for the World Cup. “We know … that he takes the development of Russian football very much to heart and, on the whole, can assist in World Cup preparations,” Putin said in Zurich. “Obviously, we will consider opportunities to participate in preparations for the 2018 World Cup in Russia, in partnership with the government,” John Mann, Abramovich’s spokesman, told The Moscow Times in an e-mailed statement. The prime minister highlighted examples of successful public-private partnerships in sports. “Construction of Spartak’s Luzhniki Stadium in Moscow will be funded by LUKoil, and Dynamo in Moscow by VTB. We are building sporting venues in Kazan and Sochi for preparations for the Student Games and the Olympics. Gazprom is building a stadium in St. Petersburg,” Putin said. “We want to attract businesses to other areas, too, so as to reduce government expenditures to the minimum,” Putin said. LUKoil is not actually funding construction of the new Spartak stadium but does sponsor the team, spending “several dozens of millions of dollars per year” to support it, a LUKoil spokesman said. The new stadium is being built by company Stadion Spartak, owned by Leonid Fedun, LUKoil vice president and majority owner of the Spartak football club, the spokesman said. “The project costs approximately 250 million euros [$330 million], out of which we have already spent 30 million,” Andrei Fedun, head of Spartak's medical department, general director of Stadion Spartak and Leonid Fedun's brother, told The Moscow Times. The stadium, which will be able to seat 42,000 people will be fully operational by 2015, Fedun said. This capacity satisfies FIFA’s general requirements. But for a finals match, a stadium seating between 60,000 and 80,000 is necessary. As of now, Luzhniki is the only one with that capacity. Fedun pointed out that building a road to the stadium may cost as much as building the actual stadium; winning the World Cup bid may finally bring the desperately needed roads to over a dozen cities, which otherwise would probably have had to wait for funding beyond 2018. Red tape will also be an issue. In the case of Spartak stadium, the decree to provide a plot of land to build on was signed in 2006, but construction did not begin until several years later. “With regional development somewhat frozen due to the economic crisis, this news will provide a much needed boost for those areas selected as host cities. Infrastructural developments such as airports, roads and stadiums will bring much needed project business to the regions and after the World Cup will be seen as legacy developments — created for an event and able to impact regional and city growth for long after,” said David Jenkins, head of hospitality for Russia and the CIS at Cushman & Wakefield. “These are not just 'proposed' facilities — they are now real projects with government support that will have to be completed by 2018. … We are likely to see increased competitiveness between contractors given the profitability of the commercial contracts that will be entered into,” said Stephen Cozens, a partner at law firm CMS. The total price tag of the 2018 World Cup for Russia could exceed $50 billion, which includes almost $4 billion on the construction of stadiums, $35 billion on new roads and railways, more than $1 billon on airport upgrades and more than $10 billion on the development of tourism infrastructure, Cozens estimated. Some firms met the announcement with caution. “It is still unclear where exactly the stadiums will be built and to whom the contracts will go,” said a spokesman for steel maker Evraz group, which is part-owned by Abramovich. While the South Africa World Cup created about 500,000 jobs and gave the country's GDP a 1 percent boost, one needs to avoid placing too much hope on the championship as a means of dramatically improving the hosting country's economy, said Kingsmill Bond, Troika Dialog's head strategist. Another concern that came up during the decision-making process is the safety of the incoming tourists, which was highlighted by the terrorist attacks in the Moscow metro in March. This did not stop Chechen President Ramzan Kadyrov from making a proposal on Friday that his republic's capital city of Grozny be used as a sight for some of the games of the championship Friday. Putin reassured the world that Russia is ready. “We are eager to do our best to secure the comfort and safety of our guests,” he told journalists in Zurich. President Dmitry Medvedev called FIFA chief Sepp Blatter on Sunday to thank him and his executive board. "Russia will stage the World Cup at the highest possible level," Medvedev was quoted by the official Kremlin web site as telling the FIFA president. FIFA's decision to award the 2018 and 2022 World Cups to Russia and Qatar respectively has received a mixed reaction around the world, with some making accusations of corruption within football's governing body. Putin rejected the allegations, saying Russia "won a tough and fair fight." FIFIPro, the international football's players' union, claims it is in possession of a document that shows the Russian Football Association and the football league have instructed clubs to supply players to their new union. In a statement released on Friday, FIFPro says it "refuses to accept this course of affairs and is involving FIFA and UEFA, amongst others, to help with the situation." FIFPro wants a "proper representation of players" in the RFS and urged Prime Minister Vladimir Putin to "guarantee that the rights of all professional footballers in Russia are respected by all stakeholders in Russian football."